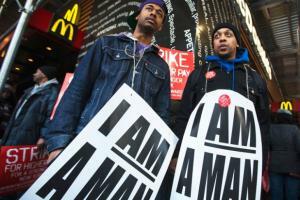 Thousands of fast food workers across 150 U.S. cities walked off the job on Thursday. Hundreds of those workers — nearly 500 of them, according to a public relations firm supporting the strikes — willfully committed civil disobedience as part of their protest, and were subsequently arrested by the police. 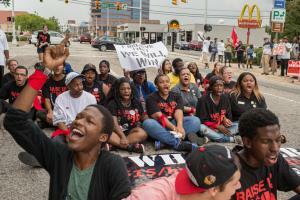 Fast-food workers plan to strike in 150 cities on Thursday, including 33 international sites. There's a protest planned at a Burger King in Germany, strikes are set for fast-food restaurants in Venice, Milan, and Rome. 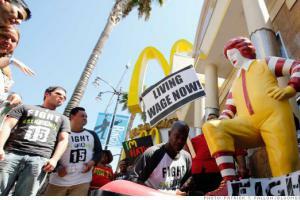 And a demonstration will take place at a Buenos Aires McDonald's. There are flash mobs planned at five McDonald's in the Philippines. The problem over the last thirty or forty years is the declining bargaining power for workers. 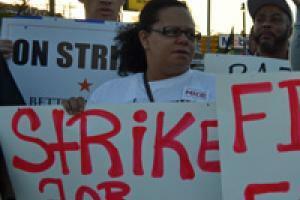 And the question is, how do we reconstruct bargaining power for workers?" That's what organizers of today's strike are out to do. 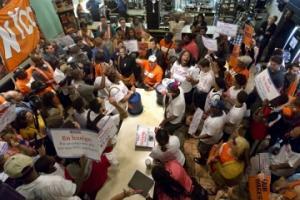 Workers say they've already achieved some incremental store-specific victories - it's too soon to say if they'll succeed. But they're already drawing near-unparalleled attention from local and national media, and the rest of the labor movement.